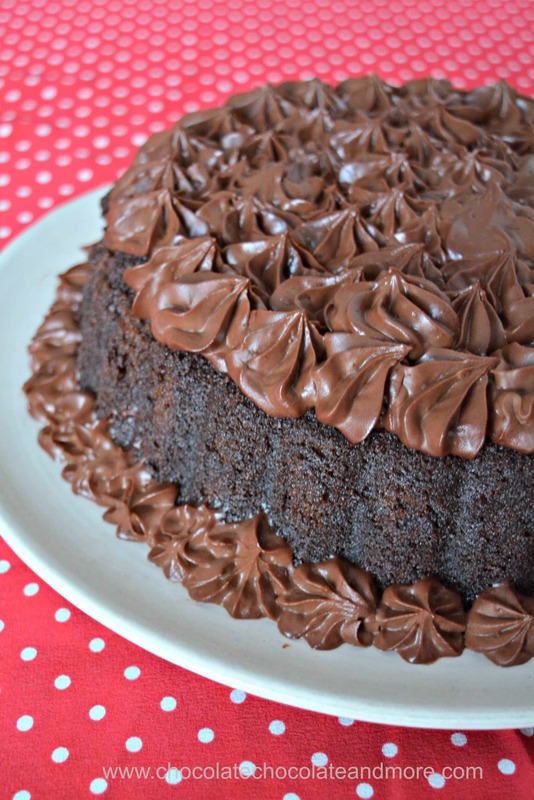 Chocolate Mousse Rum Cake - Chocolate Chocolate and More! I had a tough time naming this chocolate mousse rum cake. 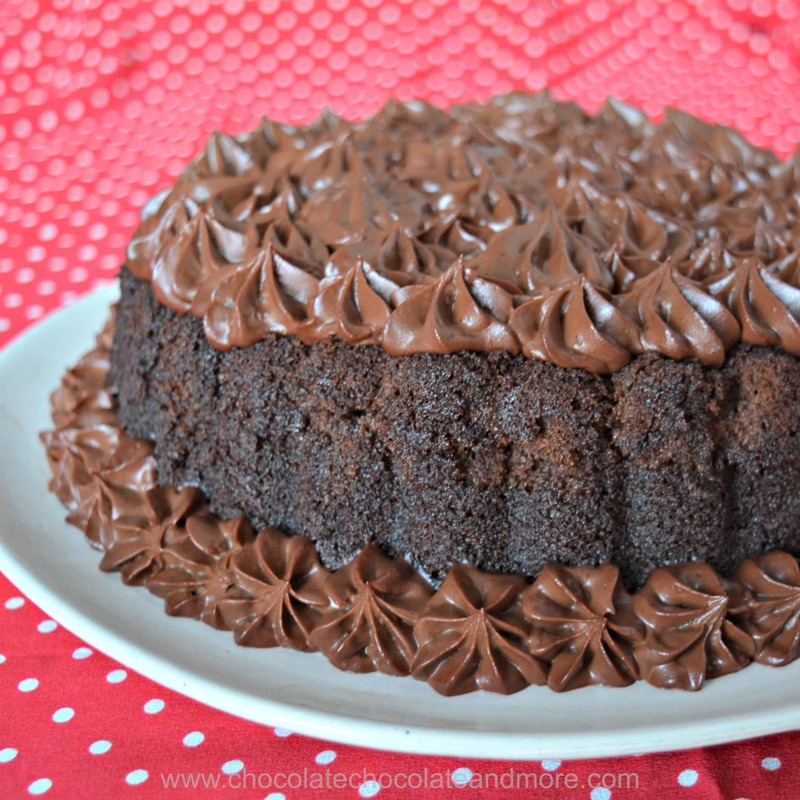 Imagine dark chocolate rum cake topped with dark chocolate rum mousse. This is a great adult dessert for the holidays and a chance to win gifts from World Vision. I can’t believe Halloween is tomorrow. This means Thanksgiving and Christmas are just around the corner. If you’re like me, you’re already shopping for gifts for the special people in your life. And, there are some folks on your list who really don’t need or want “things” but you still want to give something. Last year, around this time, I posted about the wonderful work World Vision does. They work all over the world (including the US) to alleviate poverty. When I was in college I sponsored a child in Africa through World Vision. It didn’t cost much for me but enabled her to go to school. Since that time, World Vision has broadened ways for people to help. You can buy an animal, or mosquito nets, or medicines, or a well, or basic necessities. These donations are great gifts for those on your list that already have everything they want. World Vision also sells handicrafts with purpose. A significant portion of the price goes towards World Vision programs so you can give your family and friends beautiful gifts while supporting efforts to change the world. I’d say that’s a win-win for everyone! This year, World Vision is sponsoring a giveaway for Chocolate, Chocolate and More fans living in the United States. You can win a box with an upscaled basket, organic coffee, hand carved serving spoons, salad servers and reversible placemats – $455 value! If you’re like me, you’ll find it hard to give away the items in your basket. Last year, I gave my all my gift basket items away. It was hard but everyone who received the gifts really enjoyed them. Now for the rum cake. A few years ago I made some mini chocolate rum cakes that were dense and moist. A friend requested something similar for a party. I only have one mini-bundt pan here so it was easier to make a single cake. I used a decorative 12 cup cake pan for this cake. A flat-topped bundt pan will also work well. Chocolate mousse rum cake starts with chocolate rum cake . That will need to cool and soak before you top it with mousse so start a day ahead. This is one cake that gets better with age so you can make it up to a week ahead. My chocolate rum mousse is actually a no-bake cheesecake and it’s dead simple with only 4 ingredients. The key is to refrigerate it a bit before you decorate the cake. I don’t have pastry bags so I cut a small hole (about 3/4 inch in diameter) in a gallon size ziplock bag and put my decorating tip in the hole. Then I put my mousse into the bag. I turned up the corner with the decorating tip in it to seal it off and sealed the top of the bag before refrigerating. Just before serving the cake, I pulled the bag of mousse out of the fridge and decorated the top and bottom with the mousse. You can just spoon this one the top if you don’t have decorating tips. If you’re not much into the rum flavoring, you can leave the rum out of the mousse. You can also substitute coffee for the rum in both the mousse and the cake. Grease and lightly flour a 12 cup bundt pan (pecan flour works really nicely for this). Cream butter and sugar together. Add the rest of the ingredients except chocolate chips and blend for 2 minutes on medium speed. Fill Bundt pan and bake for 45 minutes to an hour (this depends on the shape of your bundt pan). A toothpick inserted into the cake should come out clean. Cool in pan. Use a spaghetti noodle or thin skewer to poke holes in the cake (make lots of holes so the syrup can soak in). Drizzle soaking syrup over the cake and cover with saran wrap. Let soak over night. Remove cake from pan and top with chocolate rum mousse just before serving. If you have trouble removing the cake from the pan, put it in a cool oven and turn the heat to 350°F. Let bake for about 10 minutes to loosen the cake and then try again. Top with Chocolate Rum Mousse or serve the mousse on the side (like whipped cream). In a small saucepan combine the butter, water and sugar. Bring it to a boil and then cook for about 5 minutes until the syrup thickens slightly. Remove from heat and let cool until lukewarm. Add rum and mix well. Add gelatin to rum and set aside. Melt chocolate and mix in the mascarpone cheese and rum/gelatin mixture until well mixed. Refrigerate until ready to top the cake. Love this recipe. Are you calling for dark rum or a different kind? Thank you for your recipes and blog. You can use whatever you have on hand. I ran out of dark rum so mixed dark and light rum in this cake. When I make a rum raisin bundt cake I use the following alternative method for soaking the cake. After the cake is out of the oven, set it on a rack, for air circulation, for about 15 minutes to cool slightly. Then run a thin knife around cake edges, give the pan a back and forth shake and turn the cake out of the pan onto a flat surface covered with a double layer of cheese clothe. Put the cake and cheese clothe back on cake rake. Poke holes in top of cake. I use straight rum rather than a soaking syrup because my original cake recipe does not account for the sugar in the syrup. I paint some rum on the cake with a pastry brush, wrap the cake with the cheese clothe and paint the remaining rum on the cheese clothe. Once the cake is room temperature, I wrap cake and clothe in a clean trash basket liner, seal up and leave for one or two days. The rum evenly permeates the entire cake. Yum! I would think this would work with the syrup. The cake is easily removed from the pan without sticking and the small poke holes will be hidden by the mousse. Also, I usually dust the pan with cocoa powder for chocolate cakes because I always have it on hand. I bet your method makes for a potent cake. Rum cakes are definitely better after a few days but it’s hard not to dig in. Dusting the pan with cocoa powder is also a great suggestion as it doesn’t show on the finished cake. Thanks for taking the time to give these wonderful suggestions! This cake looks dreamy just perfect for the holidays! Thanks Melissa, You’re so kind. It’s definitely a holiday cake! I was wondering if this could be done in mini muffin pans, and if so what would you adjust the cooking time to be? Great recipe by the way! I’m sure you could do this in mini-muffin pans. The cooking time would be very short – maybe 10-15 minutes. Just test one in the center of the pan with a toothpick (should come out clean) to be sure. Thank you for the insight. Have a great day!